Samsung will open the world’s largest mobile phone factory in India, in a win for Prime Minister Narendra Modi’s flagship programme to lure investors to manufacture in the South Asian nation. The factory will be inaugurated by Modi and South Korean President Moon Jae-in at 5 pm local time. Both leaders are visiting the facility adjoining New Delhi, according to India’s ministry of external affairs. Smartphone makers from Xiaomi to Oppo Mobiles are building factories in the world’s fastest growing market for the product bolstering Modi’s push to encourage overseas investors to "Make in India." Asia’s third-largest economy attracted the record foreign direct investment in the past year with inflows totalling $62bn. "The opportunity is just massive," said Faisal Kawoosa, who heads new initiatives at researcher CMR. "Such a large facility will help Samsung cater to the huge demand in a country of 1.3 billion people where there are only 425 million smartphone users." India’s smartphone market grew 14% with total shipments of 124 million units in 2017, the fastest pace of growth among the top 20 markets, according to International Data. Demand for new phones is surging in India, helped in part by billionaire Mukesh Ambani offering $23 4G feature-phones, free voice services and cheap data plans. Chinese smartphone maker Xiaomi said in April it will set up three more factories in India. The new Samsung factory will have the capacity of 120 million smartphones per year and make everything from low-end smartphones that cost under $100 to the its flagship S9 model, according to the company. Earlier this year, China’s Xiaomi displaced Samsung from the No. 1 smartphone spot in the country, breaking its long-held dominance. Indians favour low-end smartphones priced at $250 or less, given the low average annual income of its people, according to Bloomberg Intelligence. That’s one reason why Apple has struggled to gain market share in India, with most iPhone models priced beyond $500, according to a Bloomberg Intelligence report earlier this month. Last year, India overtook the US last year to become the world’s second-largest smartphone market after China. 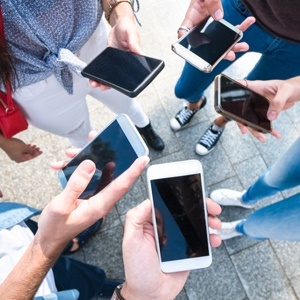 There will be 780 million connected smartphones in 2021, compared with 359 million in 2016, according to a study by Cisco Systems.